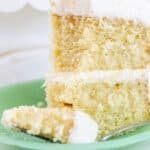 This cake is my absolute favorite vanilla bean cake. It's a scratch cake that is moist, full of vanilla bean flavor, rich and buttery with a hint of almond flavor. Grease and flour two 8" round cake pans or three 6" round cake pans. Combine the flour, sugar, baking powder, baking soda and salt in a mixing bowl and whisk. In another bowl, combine the sour cream, milk, oil, vanilla, almond and eggs. Mix well with a whisk. Now cut your butter into chunks. Turn your mixer on low and add in the butter slowly to your dry ingredients. Mix on low to medium until all the flour is coated with the butter and the mixture is crumbly. Pour in about a third of the liquid mixture. Mix on low to medium until combined. About 30 seconds. Pour the last of the liquid mixture and mix again until combined. Don't overmix the batter. Use a rubber spatula and scrape the sides of the bowl. Mix again for only about 10 to 15 seconds. Slide into the oven and turn the oven temp down to 325 degrees. Set on wire racks to cool for ten minutes, then turn the cakes out onto the racks and let them cool out of the pans completely. Cake layers can be frozen for later use. For cupcakes: Fill the cupcake wrappers just slightly over half full. Bake at 350 degrees (don't turn the oven down to 325 like the cake). Bake for about 25 - 30 minutes. Cool on a wire rack.